Take a look below to learn the variety of ways your family can experience Friends and Heroes. Watch Friends and Heroes episodes now by streaming on Amazon Instant Video or Vimeo on Demand. Friends and Heroes episodes available on individual DVDs and boxed collections. 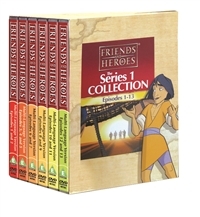 Friends and Heroes episodes available in three boxed sets of 13 episodes each. Receive a new Friends and Heroes DVD each month and SAVE!